Kier won the largest amount of construction contracts in 2018, but overall orders among the top 50 contractors sagged. Kier had been in pole position since supplanting 2017 contracts league winner Sir Robert McAlpine in February 2018 and never looked like being toppled. Glenigan’s construction market research shows that Kier secured just over £3 billion-worth of construction contracts last year. The company topped the table for the first time since 2015 but has not finished outside of the top two since 2012. The success is a positive end to a difficult year for Kier, which had to turn to the stock market to raise £264 million after net debts rose from £186 million in June to £624 million in October. Just 38% of Kier’s shareholders took up their options to buy new shares with the balance taken by banks that had underwrote the issue. Those sharehlders will be reassured by Kier’s order book, which rose 25% last year and is £1 billion bigger than second-placed Wates. Kier also finished 2018 as the most successful contractor in three of the United Kingdom’s 12 economic regions. The group was top in the East of England, where orders totalled £578 million. Orders of £529 million in the South East and £262 million in the South West also earned Kier top spot. The company’s biggest regional order book is in London, where contract awards totalled £782 million last year according to Glenigan’s construction industry research and the group was ranked fourth. After toping the 2017 league, Sir Robert McAlpine dropped down to fourth last year as major projects won more than 12 months ago fell out of the company’s rolling total. Laing O’Rourke was fifth a year ago, but slumped dropped as big projects won in 2017 including a £350 million hospital in Wales and packages on HS2 were not replaced. Interserve slipped to 28th in 2018 after the group’s construction order book halved according to Glenigan’s construction market research. Balfour Beatty had topped the annual contracts leagues from 2009 to 2013 and was third in 2017 but slumped to 15th. This was again due to less large jobs but Balfour also won fewer contracts valued at £250,000 or more. In 2017, Balfour won 72 projects but only 54 in 2018. The overall value of the combined order books of the top 50 contractors also fell last year. In 2018, the top 50’s combined order books were worth £32.4 billion, which is 24% lower than the previous year. The latest total is also the smallest aggregate figure amassed by the top 50 since 2014’s figure of £29.5 billion. This is partly due to fewer major projects, which produced a spike in 2017 such as HS2 and packages on the Hinckley nuclear power station development. This dearth of big jobs is reflected in the average size of contract won by top 50 contractors, which slipped back to £14.9 million in 2018. 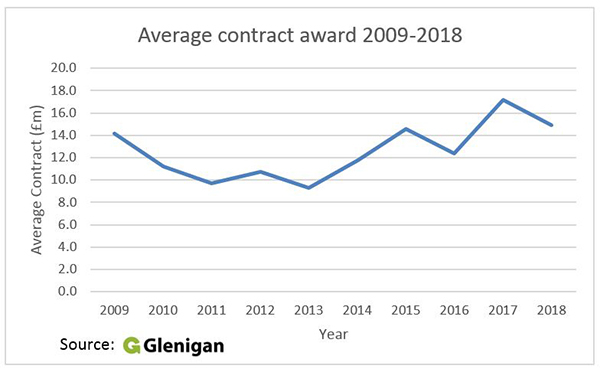 This drop in contract awards is also why Glenigan is forecasting a 2% slump in the underlying value of construction project starts but next year should produce an improvement.